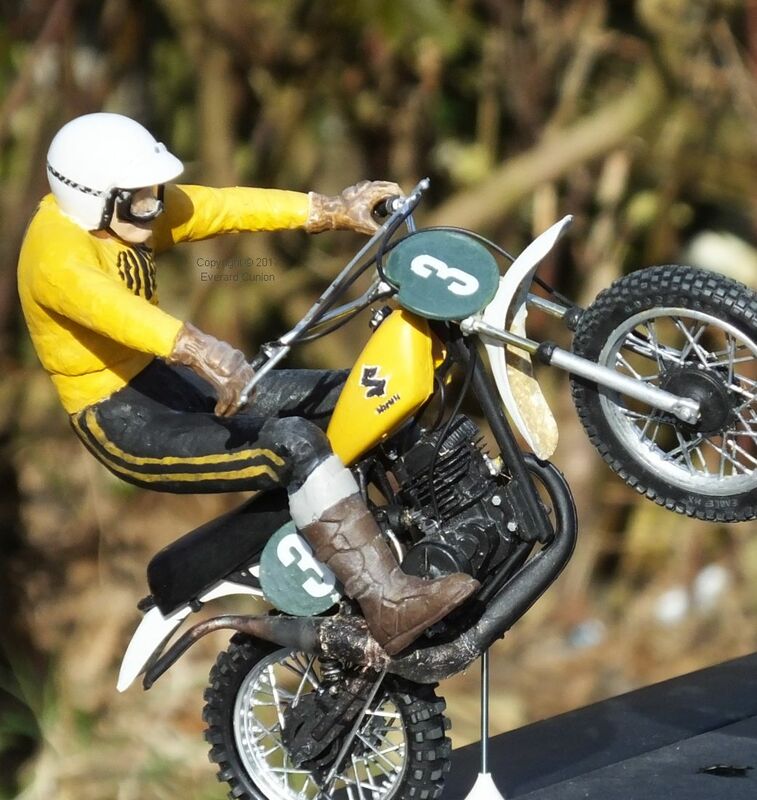 Here is how I built a 1/12th scale ‘twin shock’ works Suzuki motocross bike as ridden in the 250cc class by world champion Joël Robert in 1970. 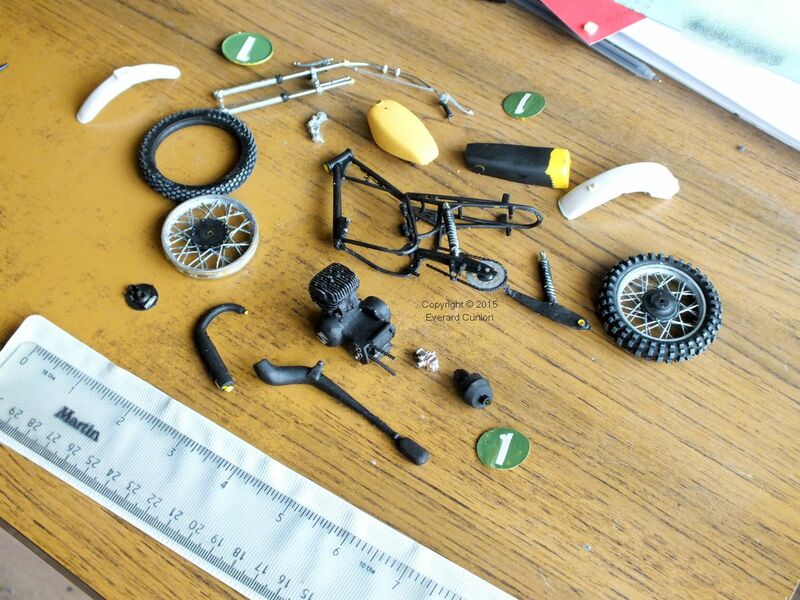 The bike is seven inches (17 cm) long. In 1970, Suzuki, an up-and-coming motorcycle manufacturer in Japan, recruited the Belgian motocross rider Joël Robert, already the 250cc class World Champion riding for CZ. Possibly inspired by the titanium Lockheed SR-71 supersonic reconnaissance aircraft that flew over Vietnam from a base in Japan, Suzuki engineers built their motocross bike largely of titanium, although the frame was of chrome-molybdenum steel. As a result, it was about 30 lb (14 Kg) lighter than other manufacturers’ bikes (according to at least one motocross historian). 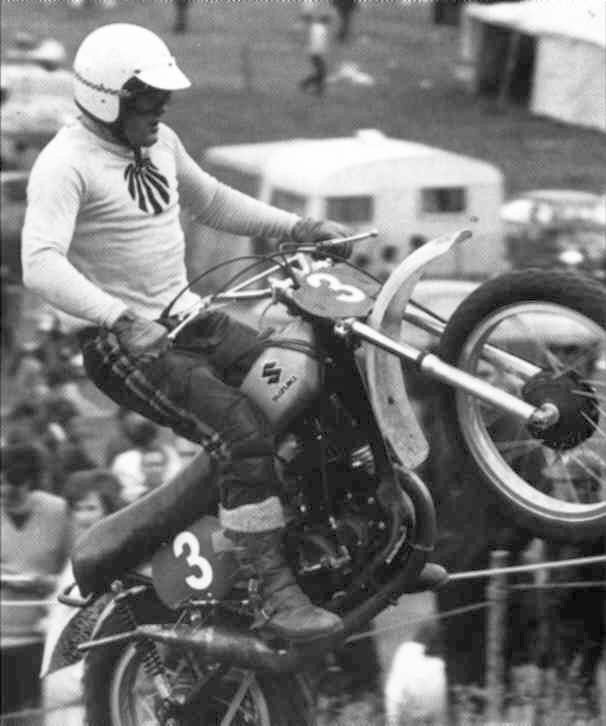 Robert became world champion on the exotic 250cc Suzuki in 1970, 1971, and 1972. Roger DeCoster’s 370cc version, on which he won the 500cc class world championship in 1971 and 1972, was almost identical. In 1973, the FIM banned the lightweight Suzukis. You could not buy one anyway. 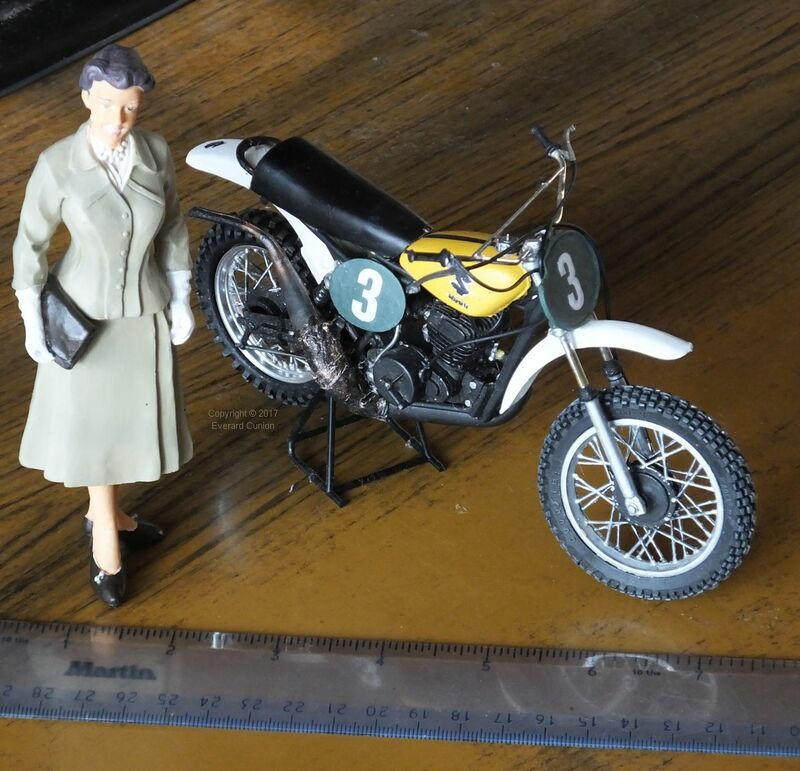 The Revell 1/12th scale Suzuki reportedly appeared first in 1974. It is a vintage kit of a vintage bike and is no longer made, but I obtained a second-hand partly assembled example (with parts missing). 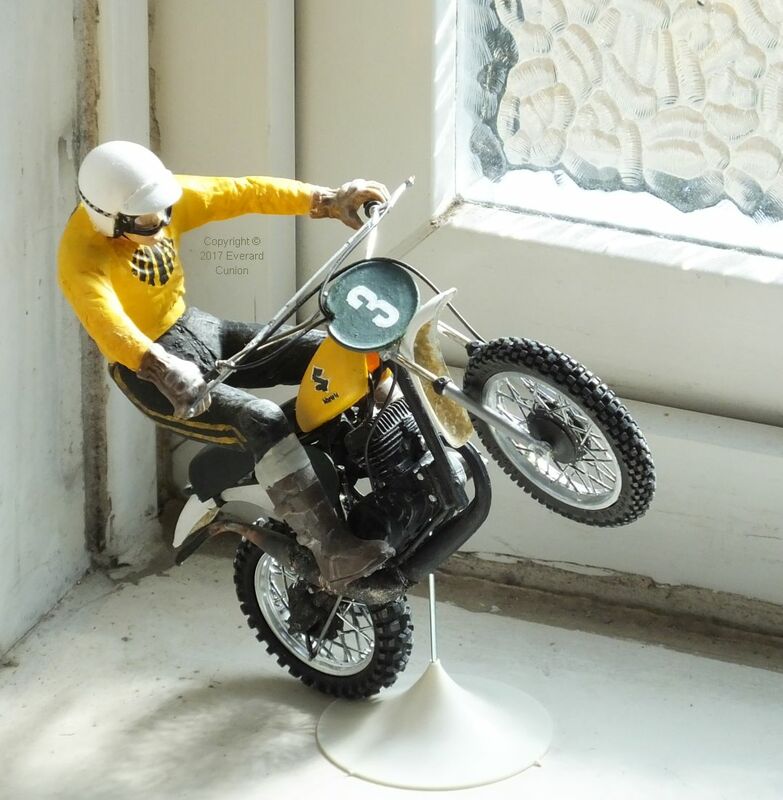 According to the box blurb, it is based on the bike ridden by Joël Robert’s Suzuki team mate and fellow Belgian Roger DeCoster. The kit does not come with a rider. I obtained two riders by buying a Tamiya 1/12th scale Honda CR450R motocross bike and a Tamiya 1/12th KTM 250MX, both of which come with riders. 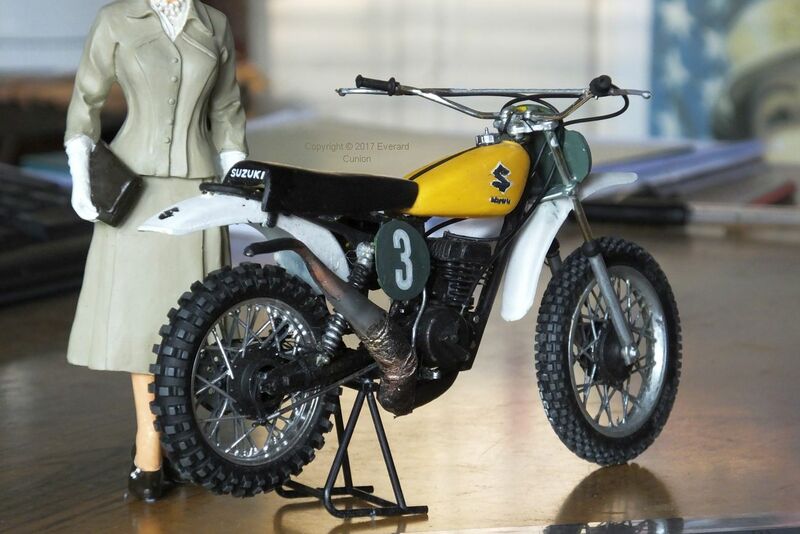 (They are the only motocross bikes I know of in this scale that come with riders.) The Honda rider is in the jumping position while the KTM rider is cornering. The Honda bike, like the Suzuki, has a two-stroke engine and I used some of its parts to replace equivalents in the much older Suzuki kit. 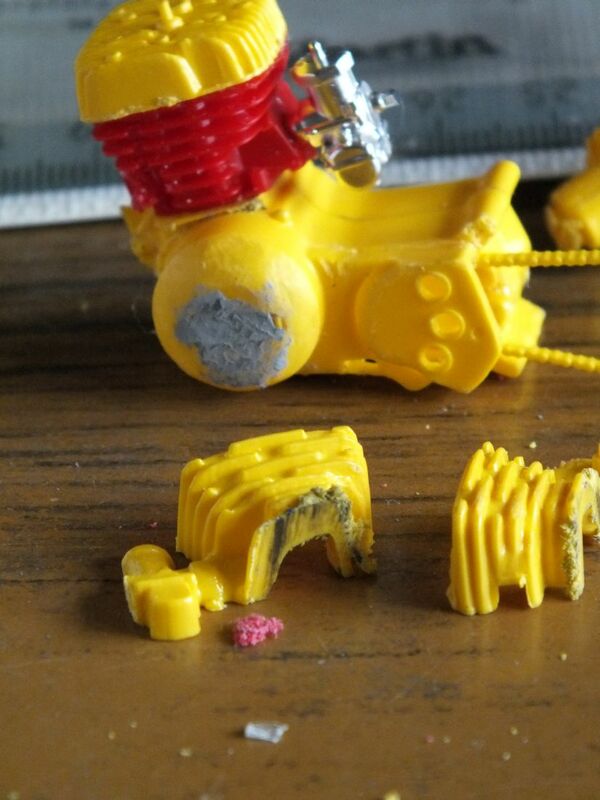 The Revell Suzuki (yellow plastic) has some shortcomings, one of which is the poorly moulded cylinder. I replaced it with the finely moulded cylinder from the Tamiya Honda (red plastic) which, when cut to size (lopping off the top) happens to have the correct number and layout of fins to match those of the Suzuki. The engine is 1.25 inches (3.2 cm) long and the same high. I also replaced the Revell carburettor with that from the Tamiya Honda (metal coated plastic). 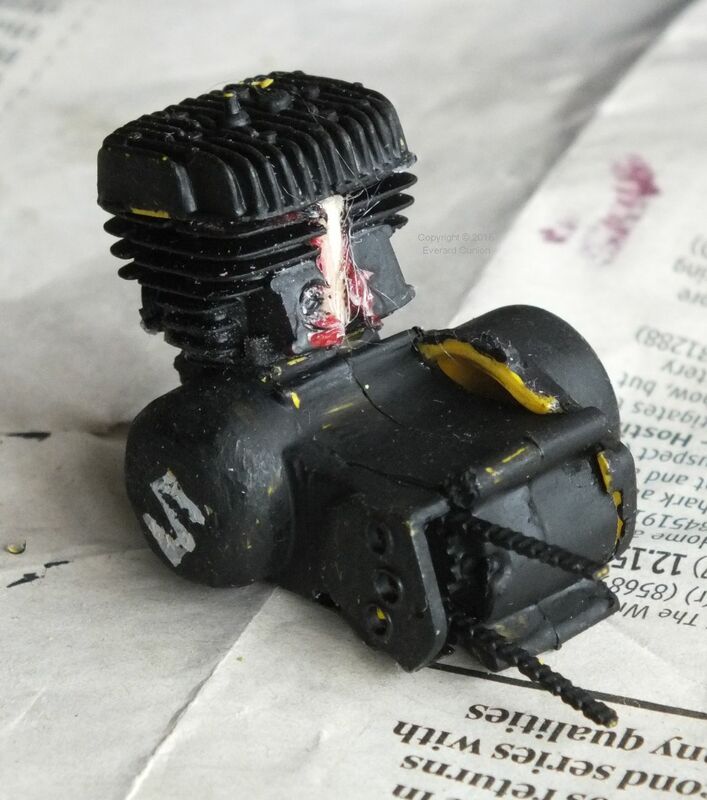 The cylinder of Revell Suzuki engine (yellow) is moulded in two halves along with the crank case, carburettor, and air filter, so some sawing was required to replace the cylinder. I also moved the exhaust port on the Honda cylinder (red) to one side by sawing and gluing. 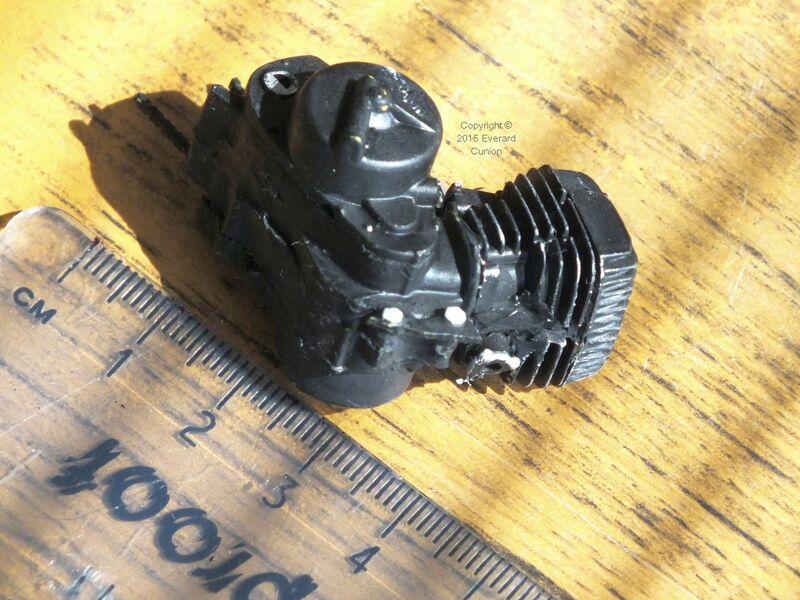 The left side cover on the crank case (the flywheel cover I assume) is too large and too cylindrical and it has the word ‘Suzuki’ embossed in a recess instead of the styled ‘S’ on Joël Robert’s machine. 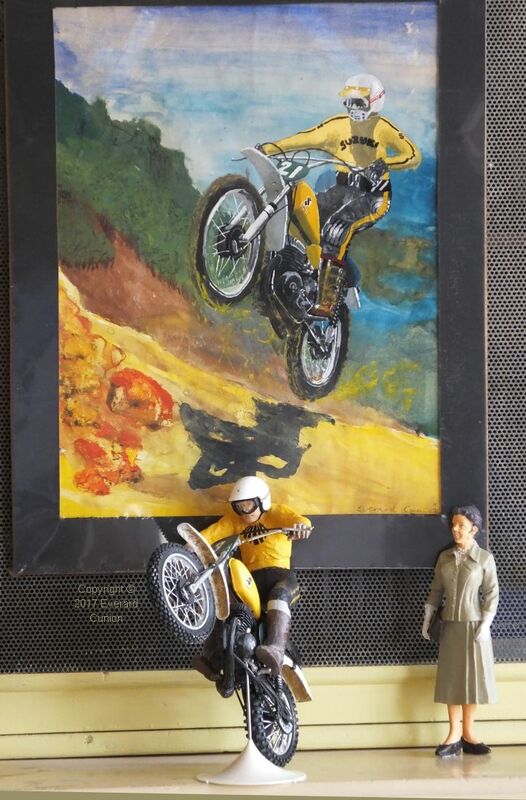 I filed it into a shape that resembles the distinctive shape on the bikes, although it is still oversized, and I filled the recess with modelling plastic putty. The Revell Suzuki cylinder head overhung the Tamiya Honda cylinder at the sides, so I broke the engine apart again and inserted short lengths of matchstick to widen it. The fins of the cylinder head of the Tamiya model are differently arranged, so I retained the Revell Suzuki cylinder head. I removed the sprocket cover, which revealed the absence of a sprocket. I then added the sprocket from the Tamiya Honda. I also used the exquisitely moulded rubber rear tyre from the Honda. 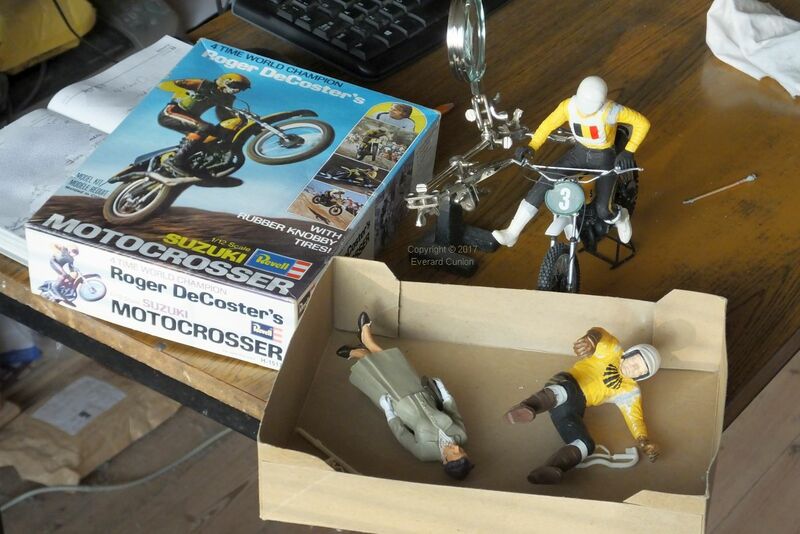 The Revell Suzuki kit is of Roger Decoster’s 370 cc bike of a couple of years later. However, the left side engine details are as wrong for that bike as they are for Joël Robert’s bike. Its exhaust pipe is visibly different, so I used part of the expansion chamber of the Honda exhaust pipe combined with the original Suzuki pipe (all done after I took the accompanying photo). Unlike the details on the left side of the crank case, the clutch case looks realistic to me. An unexpected difficulty was a missing right side hub for the rear wheel with attached brake arm. (I failed to spot that it was missing in the eBay listing photos.) Again, the Honda kit came to the rescue. I used its rear wheel (as well as the rear tyre) and its rear brake arm. 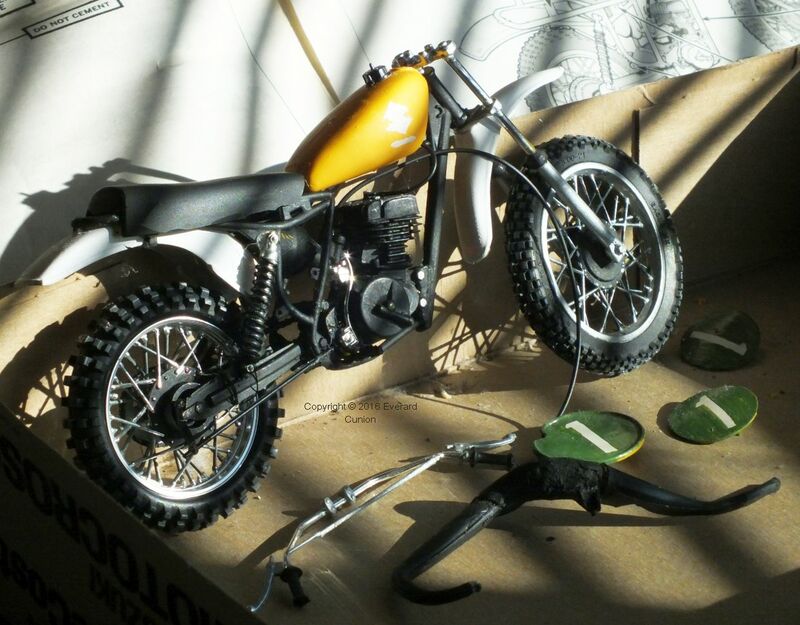 Unsurprisingly, the Tamiya kits – both the Honda and the KTM – are an order of magnitude better engineered than the much older Revell kit. Both come with metal screws and axles for strength, and a small screwdriver for the tiny cross-heads, none of which helped with this build. In the interests of expediency, I left the rear shock absorbers in their later farther forward location, which presumably is a genetic marker of the motorcycle’s evolution to the now ubiquitous ‘monoshock’ configuration. Some things were not right and had to be reshaped with a knife and/or saw, including the seat, which in the kit’s standard configuration rests too high on the frame. The fuel tank decals (transfers) supplied are for a later version. Possibly they model the production bike, which – according to those who know – was nothing like the works bikes. Therefore, I hand-painted the logos on the fuel tank, starting with white as in the photo. After taking this photo, I painted over the number plates in a bluer shade of green and applied the number decals visible in the other photos (3 in white) supplied with the Tamiya Honda. For attaching the control cables to the plastic, I found that Bostik works better than either polystyrene cement or superglue. 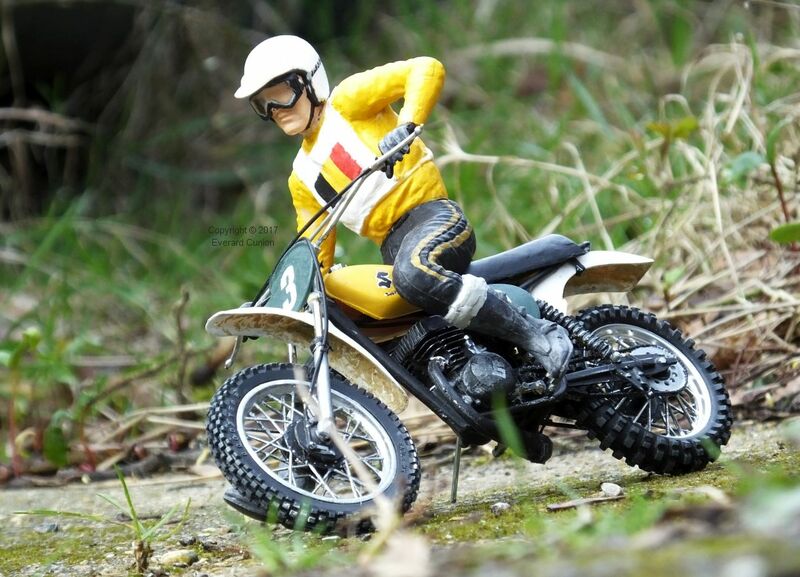 As mentioned earlier, the Revell kit does not come with a rider, so I also bought a Tamiya 1/12th scale Honda CR450R and a Tamiya 1/12th scale KTM 250MX, both of which come with riders. These guys are nearly six inches tall – or they would be if they were standing upright – and consist of five parts each (combined torso-and-head, legs, and arms each in two halves) so they are easy to construct and paint. The fit is good in both riders. However, neither exactly fitted the Suzuki, as a result of which I had to adjust some limbs. 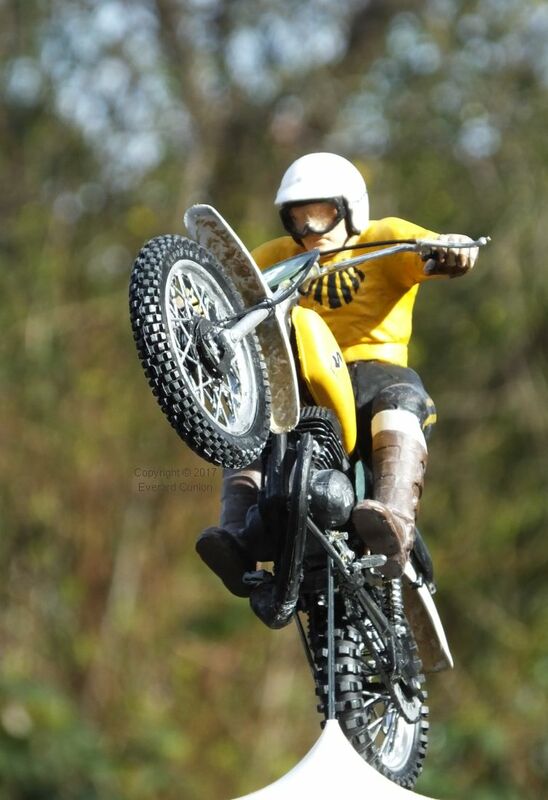 The rider in a jumping pose came with a Tamiya 1/12th scale Honda CR450R. That rider is also available as a separate kit (without the bike) but, when I bought mine, the kit of both bike and rider was on offer for less money than just the rider. That was fortunate because the Honda kit provided some parts essential to complete the pre-owned Revell Suzuki. The jumping rider resembles Joël Robert in that he is a stocky fellow. To fit the Suzuki, his legs needed to be a bit more spread than ‘natural’, which resulted in a gap at the crotch, which I filled with plastic putty. 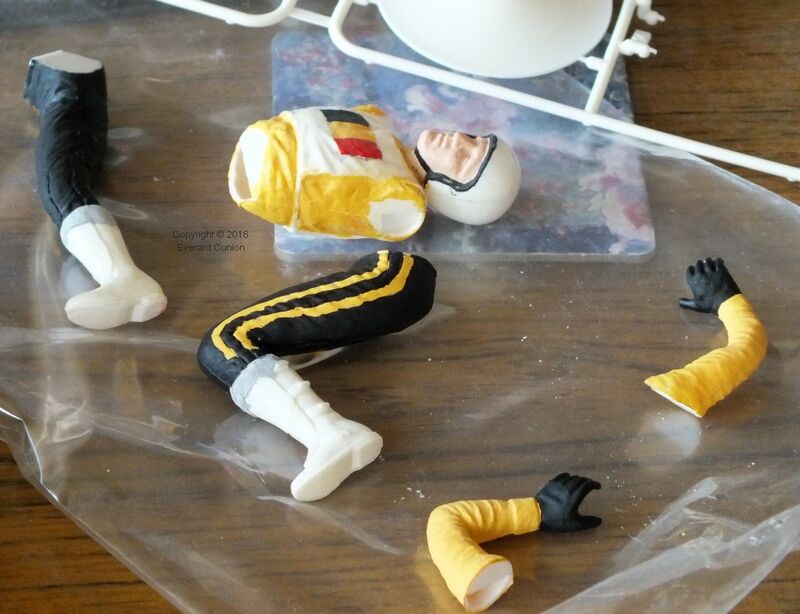 In addition, I had to reposition his arms and fill in the resulting gaps at the shoulders as well as cut one of his hands off and glue it back on rotated by a few degrees. 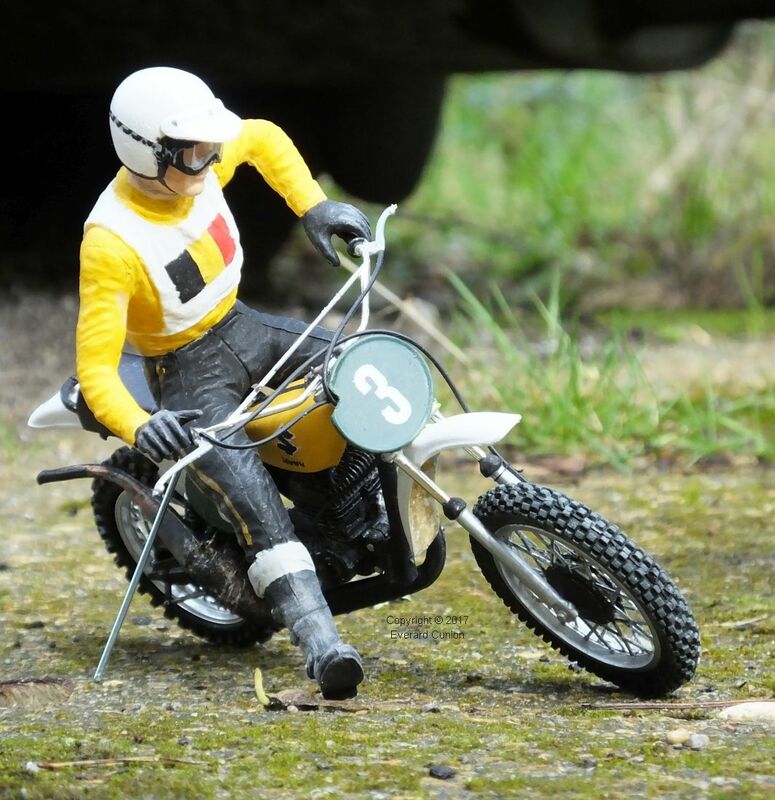 The rider in a cornering pose came with a Tamiya 1/12th scale KTM 250MX, which I bought solely for the rider. This guy’s details are finer than those of the jumping rider, although both are perfectly good. However, a cornering rider usually tilts his head more upright than his body, whereas the kit has his head in line with the body. More sawing, filing, and re-gluing to tilt his head… The photos show him after the head-tilting operation. Both riders needed filler in their left arm-shoulder joints. The result captures the colourful, exciting, and optimistic outlook of the early 1970s, at least as it seems to me. The jump stand with a metal rod came with the Tamiya Honda. The metal rod from the jump stand is also useful without the base.